For now, network TV series typically live and die by their Nielsen ratings. Since most fans do not live in Nielsen households however, the average person’s preferences aren’t taken into account, and that is frustrating. While we can’t change the system, we want to give you an outlet for your opinions, so we invite you to vote for your favorite and least favorite TV show episodes here. Which network programs are the best or the worst? If it were up to you, which TV series would be cancelled and renewed? . ABC shows (so far): America’s Funniest Home Videos, $100, 000 Pyramid, American Housewife, American Idol, Alex, Inc., The Bachelor, The Bachelor Winter Games, Black-ish, Burden of Truth, Celebrity Family Feud, Child Support, The Crossing, Dancing with the Stars, Deception, Designated Survivor, For the People, Fresh Off the Boat, The Gifted, The Goldbergs, The Gong Show, The Good Doctor, The Great American Baking Show, The Great Christmas Light Fight, Grey’s Anatomy, How to Get Away with Murder, Kevin (Probably) Saves the World, The Last Defense, Marvel’s Agents of SHIELD, Marvel’s Inhumans,Match Game, The Middle, Modern Family, Once Upon a Time, The Proposal, Quantico, Roseanne, Scandal, Shark Tank, Speechless, Splitting Up Together, Station 19, Sundays with Alec Baldwin, Take Two, Ten Days in the Valley, To Tell The Truth, The Toy Box and What Would You Do? CBS shows this season (so far): 9JKL, The Amazing Race, The Big Bang Theory, Big Brother: Celebrity Edition, Blue Bloods, Bull, Code Black, Criminal Minds, Hawaii Five-0, Instinct, Kevin Can Wait, Life In Pieces, Living Biblically, MacGyver, Madam Secretary, Man with a Plan, The Mayor, Me Myself & I, Mom, NCIS, NCIS: Los Angeles, NCIS: New Orleans, Ransom, Salvation, Scorpion, SEAL Team, Superior Donuts, Survivor, SWAT, Wisdom of the Crowd, and Young Sheldon. CW shows this season (so far): The 100, Arrow, Crazy Ex-Girlfriend, DC’s Legends of Tomorrow, Dynasty, The Flash, iZombie, Jane the Virgin, Life Sentence, Masters of Illusion, My Last Days, The Originals, The Outpost, Penn & Teller: Fool Us, Riverdale, Supergirl, Supernatural, Valor, and Whose Line Is It Anyway. 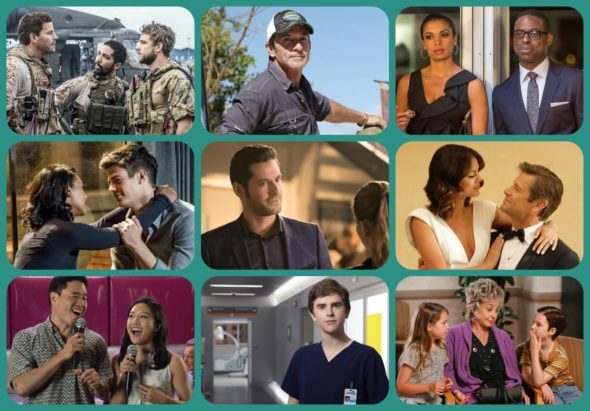 FOX shows this season (so far): 9-1-1, Beat Shazam, Bob’s Burgers, Brooklyn Nine-Nine, Empire, The Exorcist, Family Guy, The Four: Battle for Stardom, Ghosted, Gordon Ramsay’s 24 Hours to Hell and Back, Gotham, Hell’s Kitchen, LA to Vegas, The Last Man on Earth, Lethal Weapon, Love Connection, MasterChef, MasterChef Junior, The Mick, New Girl, The Orville, The Resident, Showtime at the Apollo, The Simpsons, So You Think You Can Dance, Star, and The X-Files. NBC shows this season (so far): American Ninja Warrior, America’s Got Talent, AP Bio, Better Late Than Never, The Blacklist, Blindspot, The Brave, Champions, Chicago Fire, Chicago Med, Chicago PD, Ellen’s Game of Games, Genius Junior, The Good Place, Good Girls, Great News, Law & Order: Special Victims Unit, Law & Order True Crime, Little Big Shots, Making It, Marlon, Reverie, Rise, Running Wild w/ Bear Grylls, Shades of Blue, Superstore, Taken, This Is Us, Timeless, Trial & Error, The Voice, The Wall, Will & Grace and World of Dance. What do you think? Which network TV shows do you rate as wonderful, terrible, or somewhere between? If it were your call, which TV series would be cancelled or renewed for another season? Don’t forget to vote, and please share your thoughts, below. Some comic book shows have gone too far out in left field. Compare the comics from yesteryear to what is being shown today….outrageous. Some shows started interesting and great to view then reverted to dirt…. Anxiously awaiting the return of Good Behavior Season 3!! Flash point best show ever! Wish it would return. I hope you guys change your mind and renew deception it’s one of the most unique shows out there it combines elements of mentalist with now you see me into a good non stop action packed crime show the characters were all devoloped well n the story was very well written please abc rethink your strategy it was your highest rated midseaskn show plz bring it back. #renewdeception. We Loved The Crossing! It was ALWAYS on the top search list on my Dish search. I can’t believe it was cancelled! DWTS is the best reality show ever! I hope there will be the 30 season. HTGAWM is also a great show. But Roseanne cancellation was a huge mistake! Loved Imposters. One of the very best shows. Quick witted, interesting characters with great chemistry. Ihe most original concept I’ve seen. I’m surprised it’s cancelled as everyone I know who has watched thought the same. This cancellation is wrong! Code Black is the best written, scripted and acted show on this network. Agreed! That’s why it was cancelled. It seems anythingintelligent is cancelled for mindless drivel or cheap reality shows. Siren is the best show do not cancel this Show go Eline Powell aka (RIN). Siren is the best show. Do not cancel this series go Eline Powell aka Rin you are the best. Siren should be on this list !!! Love the show !! !